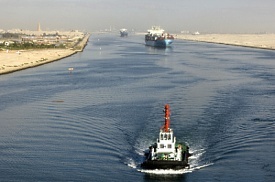 The Suez Canal runs 100 miles between the sand dunes of the Sinai Peninsula and the Nile River delta. Cruise ships often dock toward the canal's north end at Port Said, a gateway to Cairo. From the port of Safaga at the south end, passengers are offered shore excursions to the ancient city of Luxor, where Tutankhamen was entombed.